:Beginning with your private world--your thoughts, body, actions, and ultimately your God-ordained destiny--you can take charge. Authority is yours for the taking. Then, because God established and so honors the principle of authority, He will back you as you walk in the government He has delegated to you concerning your extended world--your home, family, business, and possessions. Finally, God's plan is for you to partner with Him on the earth in broader realms of influence and authority--your universal world. Jesus, the sovereign King over the earth, wants to rule institutions, cultures, societies, and governments through you and your prayers. Authority in Prayer will show you how to take hold of God's promises and pray with the authority He wants you to have. God needs you. Are you ready to use your God-given authority to further His kingdom? 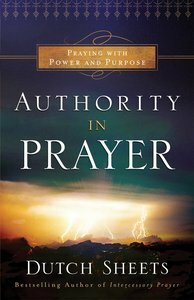 About "Authority in Prayer: Praying With Power and Purpose"